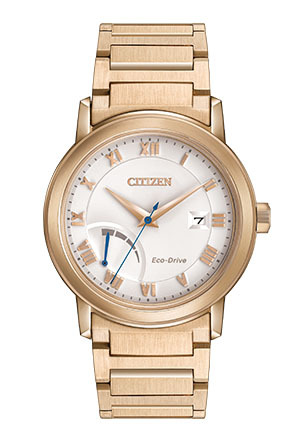 The design of this timepiece from CITIZEN®'s PRT collection makes way for a sleek looking timepiece, luxurious in appeal. Shown in a rose gold-tone stainless steel case and bracelet, this timepiece features a power reserve indicator, a screw-back case, and a spherical crystal. Water resistant up to 100 metres.